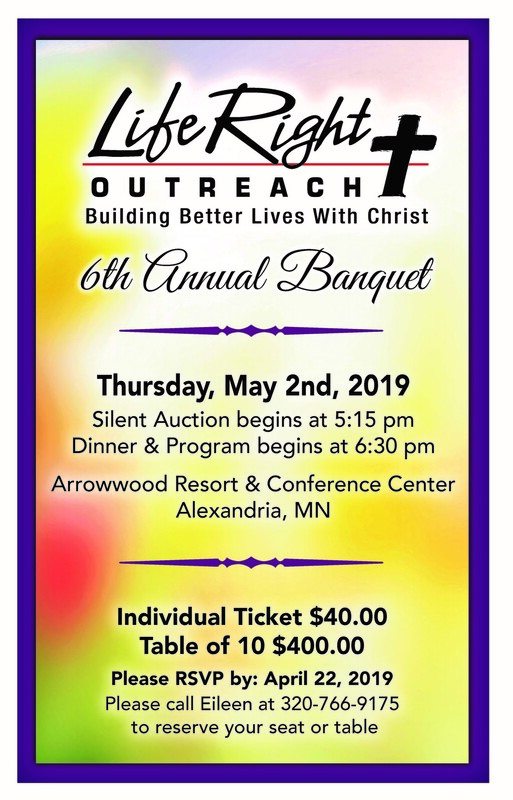 Join us for the 6th Annual LifeRight Outreach Banquet on Thursday, May 2nd, 2019. It is held at Arrowwood Resort and Conference Center. The Silent Auction begins at 5:15pm. Dinner and Program begins at 6:30pm. Individual Ticket cost is $40. Purchase a Table of 10 for $400. Contact Eileen at (320)766-9175 to reserve your seat or table. It is our Mission to “Build Better Lives With Christ”. Get your TICKET TODAY!